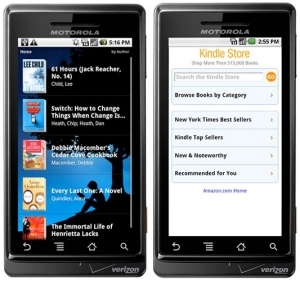 Kindle for Android Released | Android Blast! Amazon has finally released the Kindle app for Android. Customers can now download this free application from Android Market and enjoy Amazon's vast selection of Kindle books on their Android-powered devices. The free Kindle apps allow U.S. customers to discover and read over 620,000 books in the Kindle Store -- the largest selection of the most popular books that people want to read -- including New York Times Bestsellers and New Releases from $9.99. Like all Kindle apps, Kindle for Android includes Amazon's Whispersync technology, which saves and synchronizes a customer's books and bookmarks across their Kindle, Kindle DX, BlackBerry, iPad, iPhone, iPod touch, Mac, PC, and now Android-powered phones so customers always have their reading material with them and never lose their place. "Our customers tell us they love the convenience of having their Kindle library with them everywhere and their reading synchronized across multiple devices," said Dorothy Nicholls, director, Amazon Kindle. "With Kindle for Android, customers can choose from a vast selection of over 620,000 books to read on their Android-powered phone, no matter where they are -- on the bus, waiting for a cab, or in between meetings. Kindle for Android and the rest of the free Kindle apps are the perfect companions for readers who don't have their Kindle with them or don't yet own a Kindle."